So we've gathered some of friends together for a good time this week here at BaseballHQ.com. 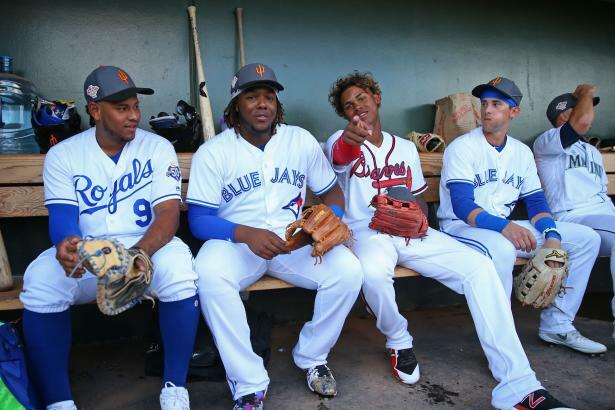 Several of the players above, in fact (Meibrys Viloria (C, KC), Vladimir Guerrero Jr. (3B, TOR), Cristian Pache (OF, ATL and Cavan Biggio (IF, TOR)) will be joining us—but the focus is breaking down, discussing, arguing over the 2019 HQ100. For five straight days. We call it #HQ100Week, and it's here. Monday kicks off the week with the 2019 HQ100 prospect list. Wednesday, when we release the six rankers' individual lists, so subscribers can see for themselves how we each put our philosophies to work. It's always an interesting look to compare and contrast these individual lists that make up the HQ100. Also, we'll delve further into player-specific questions in our Wednesday Roundtable. Thursday, we again hit the Roundtable and focus on rebounds and 2019 specific fortunes. Friday, we wrap up #HQ100Week with a focus on the on a year in the future, asking our rankers to sell us on players who didn't make the 2019 list, but have a shot at breaking through in the 2020 HQ100. Here's your list of players who could be big movers, and on whom it might be worth getting in early. Soon, we'll be pivoting to by-position prospect lists, but don't miss our other two big works on minor-leaguers this offseason: The Organization Report homepage (including several team reports that are FREE), with links to Top 15 lists and scouting reports from all 30 MLB clubs, and our printed 2019 Minor League Baseball Analyst, where we have filed reports on over 1000 minor league players. The book can still be ordered at any time; and will be shipped in late January. You get immediate access to the PDF and Excel support files when you order. So join us all week long as we break down one of BaseballHQ.com's most popular features, the HQ100.